The current Rangers training camp at the Madison Square Garden Training Center marks the 84th time that NHL players and prospects have gathered for the process of determining an opening night Blueshirts roster. It is also the sixth consecutive year that training camp has been held at the Training Center. Over the team's 85-season history, however, camp has been held in a wide variety of locations, as a total of 21 different cities have been the site of a Rangers training camp. Winnipeg, where camp was held 15 times between 1934 and 1964, has been the most common host. Rye, N.Y., is second on the list with 10 training camps, followed by Kitchener, Ontario (nine camps) and Burlington, Vt. (eight). Here, in chronological order, is a look at 10 remarkable bits of Rangers training-camp history. Lester Patrick (top left) poses with members of the original New York Rangers team at the Blueshirts' very first training camp, which was held in Toronto. 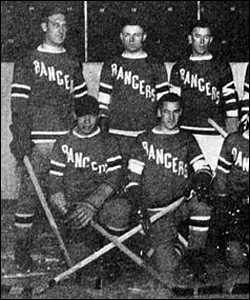 On Oct. 19, 1926, the first group of Rangers -- 16 players in all -- gathered at the University of Toronto for the team's very first training camp. The location was chosen by Conn Smythe, the Rangers' general manager and head coach who had coached the University to a Canadian intercollegiate championship the previous spring. Smythe lasted all of one week at the Rangers training-camp helm before a dispute with management led to his exit and the beginning of the Lester Patrick era. Patrick, already a hockey innovator, came in to oversee the players Smythe had recruited. Patrick inherited some pretty good players, including future Hall of Famers Bill Cook, Fred "Bun" Cook, Frank Boucher and Ivan "Ching" Johnson. However, a look at the team's 1926 training camp photo shows another Hall of Famer who didn't even make the cut. Joe Primeau, who went on to win the Stanley Cup with Toronto at the Rangers' expense in 1932, was right there in that first training camp, looking to at least earn a spot on the Rangers' minor-league affiliate in Springfield, Mass. Unfortunately, Primeau was only 20 years old and not deemed ready to make the jump to the pros. He signed with Toronto two years later and the rest is NHL history. The legendary Montreal Forum, where Les Canadiens played for 70 years until 1996, was actually the site of a Rangers training camp at the height of the Great Depression. In 1933, after having won the Stanley Cup the previous spring, the Blueshirts traveled north to Montreal for training camp. Previous camps had been held in Toronto, Springfield, and Lake Placid, N.Y., but with the Canadiens training at Kingston, Ontario, the Forum was available. Rangers players reported to camp on Oct. 20 and ended up sharing the Forum with the other local NHL team, the Montreal Maroons. When both teams got there, they discovered that the arena staff had done a poor job preparing the ice, and they had to spend the first couple of days training off-ice in local gymnasiums while the ice was improved. During the preseason, the Rangers ended up playing both the Canadiens in Kingston and the Maroons at the Forum. Lester Patrick had plenty of incentive to move the Rangers' training camp to Winnipeg in 1934, because he was opening up his own summer hockey school in that city for young amateurs with pro aspirations. Patrick's plan was to run the amateur school and then select prospects who could move on to the Blueshirts' main camp. The plan worked well for the next 13 seasons as Winnipeg became the Rangers' home away from home until shortly after Patrick stepped down from his general manager's position in February 1946. Once Patrick turned the general manager duties over to Frank Boucher, only one more training camp was held in Winnipeg before camp was moved to Lake Placid, N.Y., for the next four years. The Patrick/Rangers hockey school was such a success that by its final year of 1946, nearly 80 players attended and almost a quarter of them moved on to the main camp with pro contracts. Eventually, camp returned to Winnipeg in 1963 and 1964. The man known as Mr. Hockey, Gordie Howe, was only 15½ years old when he and a group of young friends from Saskatoon, Saskatchewan, drove more than 400 miles to Winnipeg to attend the Lester Patrick Hockey School in 1943. With so many men in the military during World War II, the Rangers were desperate for players at all levels of the organization. It was a golden opportunity for younger players to get on the team's radar and begin their journey to the NHL. In those days, players did not become property of a team until agreeing to play in their junior system, and at age 15, Howe had not yet made such a commitment but was old enough to do so. Since Howe never joined the Rangers, the story has erroneously circulated that the team had him at training camp, but mistakenly let him go. Nothing could be farther from the truth. In a 1980 New York Times interview with Dave Anderson, Howe explained that the Rangers really did want him and had asked him to join their junior team in Regina, Saskatchewan, less than one week after he arrived in Winnipeg. Howe said he would only join the team if he knew that some friends from Saskatoon would be going, too. When the Rangers told him they weren't interested in any of the other Saskatoon kids, Howe chose to go home rather than report to Regina. The following year, Howe was invited to a Detroit Red Wings camp. Detroit asked Howe if he would be willing to go to their junior team in Ontario. Knowing what had happened in 1943, the Red Wings assured Howe that several of his friends from Saskatoon were going to go with him in 1944. Eager to be with friends, Howe became Red Wings property. On Aug. 16, 1954, Rangers General Manager Frank Boucher made a surprising announcement: The Blueshirts would hold their 1954 training camp in Vancouver, British Columbia. After the Winnipeg years, the Rangers had staged training camps in Lake Placid, Guelph, Ontario, Saskatoon, Saskatchewan, but prior to the Vancouver announcement, no NHL team had ever trained in that city. Vancouver remains the Western-most location that the Rangers have ever held a preseason camp. The choice of Vancouver was likely due to the success of the previous year's Saskatoon camp and the opportunity to play exhibition games against minor-league teams in the Western Hockey League. On Sept. 19, after a week of off-ice conditioning in Kamloops, British Columbia, a group of 42 NHL players and prospects reported to Vancouver. Eight years later, in 1962, the Rangers were back in that city for another training camp. The 50th annual Rangers training camp was the first held in the New York metropolitan area. Between 1955 and 1974, the team had trained in nine different cities, ranging from Providence to Winnipeg to Niagara Falls, and under the leadership of General Manager and Head Coach Emile Francis from 1967 to 1974, the Blueshirts held their camp exclusively in Kitchener, Ontario. Going to Kitchener enabled the team to face many other NHL teams in a preseason environment similar to baseball's spring training in Florida. Richmond, Va., might seem like the last place an Original Six team would hold its training camp, but in 1979, the Rangers didn't have much choice. Having announced a minor-league affiliation with the EHL's Richmond Rifles on Aug. 27, 1979, the Rangers organization found itself in dire need of a camp location. The Westchester Ice Skating Center in Hawthorne, N.Y., was unavailable because of its own financial troubles, and a pending agreement to use the new Playland rink in Rye, N.Y., would not be completed in time for the opening of camp on Sept. 16. With no other option, the Rangers went ahead and decided to hold camp at the Rifles' Richmond Coliseum home. It marked the first and only time a Rangers training camp was held in a location south of New York. U.S. Olympic legend Herb Brooks, author of the 1980 "Miracle on Ice", took over as head coach in 1981 and made a splash by holding the first part of training camp in Vierumacki, Finland. This was arranged so that the Rangers could play a series of exhibition games against Finnish and Swedish teams as part of a joint venture with the Washington Capitals, whom they also faced overseas. Leaving virtually all of the prospects back at the Rangers' main training camp in Rye, N.Y., Brooks brought most of the returning veterans to Scandinavia. Three players, however, weren't exactly Blueshirts regulars at the time. The biggest name on the trip was Bobby Hull, the Hockey Hall of Famer who was attempting an NHL comeback at age 42. Although he played in Finland and Sweden, Hull's attempt to crack the Rangers roster came up short, as he was cut after the team returned to New York. Two rookies, however, were much more fortunate. Finnish-born defenseman Reijo Ruotsalainen and forward Mikko Leinonen were both impressive making Rangers "debuts" in their native country and ended up joining the team as regulars. Rangers players who went to Finland with Brooks have fond memories both of the experience itself and their first look at Ruotslainen, who would go on to score 18 goals and 56 points as a rookie in 1981-82. Fifty-five years after a training camp held at the Montreal Forum, the Rangers returned to the province of Quebec for their first training camp under head coach Michel Bergeron. The selection of Trois-Rivieres had everything to do with Bergeron, who had spent six seasons as coach of the QMJHL's Trois-Rivieres Draveurs from 1974 to 1980 before moving to the NHL with the Quebec Nordiques. Having camp in Quebec was also good for the locals because 37-year-old Hockey Hall of Famer Guy Lafleur, one of the most popular Quebec-born athletes of all-time, had joined the Rangers in an NHL comeback attempt. Training-camp practices were packed, and virtually all of the attention was on Bergeron and Lafleur. That was just how General Manager Phil Esposito had planned it, because he told reporters he wanted the other players to get out of the New York spotlight and bond in unfamiliar territory. Although the Rangers continued to train at Rye Playland throughout the 1990s, they had not held a training camp there since 1989. In the 12 years before 2001, Rangers teams had trained in only two locations -- Glens Falls, N.Y., from 1990 to 1994 and Burlington, Vt., from 1995 to 2000. The 2001 training camp was going to be different. For the first time in Rangers history, camp would open up in New York on Sept. 10, 2001. Public workouts and scrimmages would take place at The Garden from Sept. 12-14, and on Sept. 15, camp would move to Rye, N.Y. It didn't work out that way. Players gathered at The Garden for their physicals on Sept. 11, 2001, and that's where they were when terrorists attacked the World Trade Center. In the wake of the Sept. 11 tragedy -- and with security concerns at an all-time high -- camp was moved back to Rye. The 2001 Rangers training camp was the last held at Rye Playland. In 2002, camp returned to Burlington, Vt., and by 2005, it was in its current location at the MSG Training Center.